Thank you for following along here on VAVEL. The recap of the game will be up shortly. This is Thomas Cluck saying so long! 42-7 Georgia: Bulldogs quarterback Jacob Eason takes a knee and ends the game with a beatdown from Georgia to Florida, ending the Gators' winning streak in emphatic fashion here in Jacksonville. 42-7 Georgia: Florida finally gets on the board with just under three minutes remaining in the game as Zaire hands off for a touchdown and a good PAT keeps the Gators' nation-best scoring streak alive. 42-0 Georgia: Another breakaway run even without Chubb and Michel in the game anymore as the Bulldogs dive into the end zone and a successful PAT makes it a 40 plus point lead in Jacksonville. 35-0 Georgia: A huge sack of Feleipe Franks results in a loose ball and a fumble ran into the end zone from the Bulldogs. Kirby Smart's team now up a dominant 35-0 after a successful PAT. 28-0 Georgia: Another burst of speed from Sony Michel, his second touchdown of the day, breaking through the Florida defense to send the Bulldogs up four touchdown now in the second half after a good PAT. Georgia will receive the ball to begin the second half. That's it for the first half here from Jacksonville, with the Georgia up a commanding 21-0 lead as the teams go into the locker room. 21-0 Georgia: A breakaway run from Sony Michel, blasting past the Florida defense to put the Bulldogs up three touchdowns after a good PAT halfway through the first quarter here in Jacksonville. 14-0 Georgia: Off a Franks interception, Georgia takes advantage of the opportunity and keeps their strong offensive play going with a great touchdown pass from Fromm and a successful PAT sending the Bulldogs up 14-0 still early in the first quarter. 7-0 Georgia: The Bulldogs pound through Florida with a strong offensive drive as star running back Nick Chubb scores the touchdown and a successful PAT puts Georgia up 7-0 to begin. Despite initial reports, Florida will start sophomore Feleipe Franks at quarterback to begin the game. The kick is off and the World's Largest Outdoor Cocktail Party is underway here in Jacksonville. The Georgia Bulldogs won the toss and deferred to the second half. The Florida Gators will receive the ball to begin this SEC East rivalry game. We're live here from EverBank Field in Jacksonville, Florida and Georgia and Florida have walked onto the field for this big rivalry game. Check back here before game time for Georgia Bulldogs vs Florida Gators pre-game updates, news and notes, warm-ups, and more, live from Jacksonville, Florida. On the flip side, Florida and head coach Jim McElwain will have their hands full if they hope to pull off the upset this weekend in Jacksonville. The Gators quarterback woes have only worsened this year, as starting quarterback Luke Del Rio is out for the season with an injury and sophomore Feleipe Franks struggling this season. 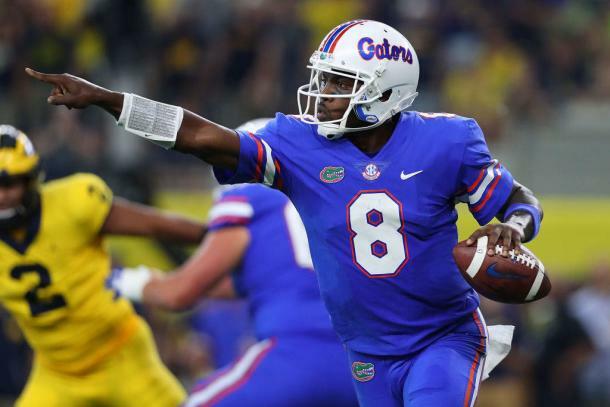 There have been reports that former Notre Dame quarterback Malik Zaire will start this weekend, hoping a change will give Florida's struggling offense a spark. The key for the Gators, if they have any hope of a win, will be to play lights out on defense, a tough task, especially against a very balanced Georgia attack. 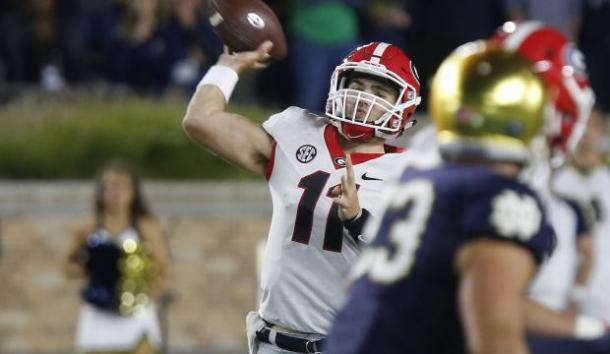 For Georgia and head coach Kirby Smart's team, the key to success in this game will continuing their dominant running game and keep true-freshman quarterback Jake Fromm in comfortable passing situations. So far this season, the running back duo of Nick Chubb and Sony Michel has been lethal for Smart's squad, with Fromm's impressive accuracy and quarterback skills complementing a well-rounded offensive attack. On defense, the Bulldogs shouldn't have too much of a challenge given the Gator's extremely low-scoring offense this year. After a bye week for both teams, Georgia and Florida come into this big game well-rested and very healthy, though the Gators are still without nine players, including three key offensive players, due to pre-season suspensions for criminal investigations. The Bulldogs come into Jacksonville this weekend ranked number three in the country and undefeated, including a very impressive win over Notre Dame in week two. Conversely, Florida has had a very mediocre season, with once again no offensive production, leaving them 3-3 and riding a two-game losing streak heading into one of their biggest games of the season. Some of the greatest moments in this game have come in the last decade, leading to some decent trash-talking over social media this week between the two teams. Back in 2007, a goal-line running touchdown from Georgia great Knoshown Moreno in the first quarter led to a planned storm of the field by the Bulldogs, resulting in multiple unsportsmanlike conduct penalties and a Georgia kick from their own eight-yard line. A year later in 2008 in response to the incident in 2007, Florida head coach Urban Meyer used his final two timeouts in the final minutes of the game leading 49-10, allowing Gators fans, even more, time to celebrate the victory. Despite the Gators' commanding wins the last decade, the 2012 upset of the undefeated Florida team, ranked two in the country, kept them from the SEC Championship, which Georgia would instead represent the east in. In the last seven years, Florida is 7-4 against Georgia, including having won the last three years. Despite a three-game Bulldogs win streak between 2011 and 2013, it been the Gators that have thoroughly held the upper hand in this rivalry, with a comprehensive 24-10 win a year ago. The Georgia-Florida game has become one of the south's premier rivalry games, with the last weekend in October always playing host to this important SEC East showdown. Given the nature of this rivalry game, weird things have been known to happen in Jacksonville on Halloween weekend, and a solid favorite Georgia team will be keen to stop that for this year. Nowhere could that be truer than this week in Jacksonville, Florida where the third-ranked Georgia Bulldogs head down to face their bitter-rivals the Gators of Florida in a rivalry game dubbed the World's Largest Outdoor Cocktail Party. SEC East and College Football Playoff implications will be on the line as Kirby Smart's Bulldogs are third in the AP Top 25 and first in the SEC East ahead of the first playoff rankings set to be released come Monday. Week nine of the college football season is upon us and so are the biggest games of the year and toughest stretches for the top teams in 2017. After solid competition to begin the season, the biggest rivalries, conference, and division matchups take place with potential College Football Playoff implications on the line as well. Welcome to live coverage of the World's Largest Outdoor Cocktail Party! 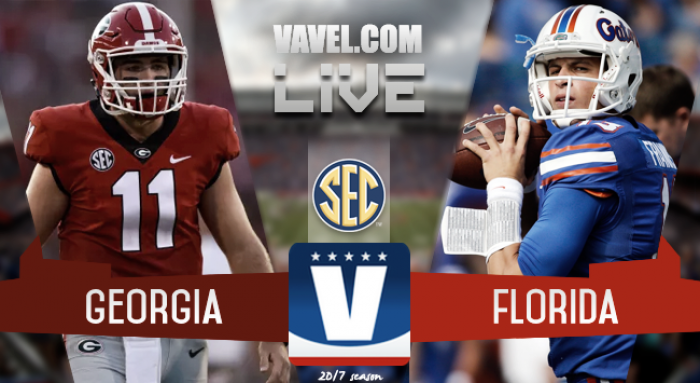 My name is Thomas Cluck, and I am happy to be bringing you play-by-play coverage of the Georgia Bulldogs vs. Florida Gators here on VAVEL. From now until the game begins at 3:30 pm ET, news, and notes will be above to get you up to speed. Be sure to return before game time for play-by-play updates!